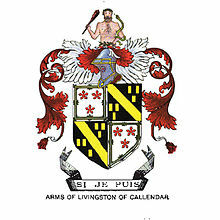 The Livingston family of New York is a prominent family that migrated from Scotland to the Dutch Republic, and then to the Province of New York in the 17th century. Descended from the 4th Lord Livingston, its members included signers of the United States Declaration of Independence (Philip Livingston) and the United States Constitution (William Livingston). Several members were Lords of Livingston Manor and Clermont Manor, located along the Hudson River in 18th-century eastern New York. Descendants of the Livingstons include Presidents of the United States George H. W. Bush and George W. Bush, First Lady of the United States Eleanor Roosevelt, suffragist Elizabeth Cady Stanton, Congressman Bob Livingston of Louisiana, much of the wealthy Astor family, New York Governor Hamilton Fish, actor Montgomery Clift, and actress Jane Wyatt. The eccentric Collyer brothers are alleged to have been descended from the Livingston family. The Livingston family's burial crypt was established in 1727 at Livingston Memorial Church and Burial Ground in New York. Liberty Hall (also known as the William Livingston House) is the home built by New Jersey Governor William Livingston, a signatory of the Constitution. Located in Elizabethtown, New Jersey, it has been designated as a National Historic Landmark, and it is operated as a museum within the Liberty Hall Campus of Kean University. sister of Pieter Schuyler, himself the brother-in-law of Stephanus Van Cortlandt and great-grandfather of Colonel James Livingston (1747-1832) and a great-uncle of Philip Schuyler. Robert Livingston (1718–1775) His grandson-in-law was George Croghan (soldier) a nephew of William Clark and George Rogers Clark. Robert Livingston (1708–1790). Father-in-law of James Duane Mayor of New York. A great grandson Ancram Livingston (b.January 30, 1828-d.November 30, 1895) was the grandson of Vermont Governor Cornelius P. Van Ness. m. Christina Ten Broeck (1718-1801), sister of Abraham Ten Broeck(1734-1810) Abraham was the husband of Elizabeth Van Rensselaer, a sister of patroon Stephen Van Rensselaer II and great-granddaughter of the first native-born mayor of New York City, Stephanus Van Cortlandt. Van Cortlandt was also related to Philipse; Delancy; Izard; Skinner families and to British Generals Sir William Johnson, 1st Baronet and Thomas Gage. m. John Armstrong, Jr., parents-in-law of William Backhouse Astor, Sr.
For an alphabetical list of people with the surname Livingston, see Livingston (surname). Carroll Livingston (1805–1867) ∞ Cornelia Livingston. ^ a b Henry Reed Stiles, ed. (1886). The New York Genealogical and Biographical Record. New York Genealogical and Biographical Society. p. 85. ^ Neil Larson (July 1985). "National Register of Historic Places Registration: Livingston Memorial Church and Burial Ground". New York State Office of Parks, Recreation and Historic Preservation. Archived from the original on 2012-10-14. Retrieved 2010-07-04. See also: "Accompanying 12 photos". ^ Bulloch, M.D., J. G. (1895). A History and Genealogy of the Families of Bellinger and De Veaux and Allied Families, With a Genealogy of Branches of the Following families, together with mention of many names. Savannah, GA: The Morning News Print. pp. 33–35. Retrieved 1 March 2018. ^ Reynolds, Cuyler (1911). Hudson-Mohawk Genealogical and Family Memoirs: A Record of Achievements of the People of the Hudson and Mohawk Valleys in New York State, Included Within the Present Counties of Albany, Rensselaer, Washington, Saratoga, Montgomery, Fulton, Schenectady, Columbia and Greene. Lewis Historical Publishing Company. Retrieved 1 March 2018. ^ Bulloch, Joseph Gaston Baillie (1919). A History and Genealogy of the Families of Bayard, Houstoun of Georgia: And the Descent of the Bolton Family from Assheton, Byron and Hulton of Hulton Park, by Joseph Gaston Baillie Bulloch ... J. H. Dony, printer. pp. 16–17. Retrieved 1 March 2018. ^ Livingston, Edwin Brockholst (1910). The Livingstons of Livingston Manor: Being the History of that Branch of the Scottish House of Callendar which Settled in the English Province of New York During the Reign of Charles the Second; and Also Including an Account of Robert Livingston of Albany, "The Nephew," a Settler in the Same Province and His Principal Descendants. Knickerbocker Press. Retrieved 1 March 2018. ^ Van Rensselaer, Florence; Laimbeer, William (1949). The Livingston Family in America and its Scottish Origins. New York. Retrieved 1 March 2018. ^ Kelly, Arthur C. M.; Brandt, Clare (1982). A Livingston Genealogy. Rhinebeck, NY: Friends of Clermont | Co-sponsored by the Order of Colonial Lords of Manors in America. Retrieved 1 March 2018. ^ Livingston, James D. (1986). A Livingston Genealogy. Friends of Clermont, Order of Colonial Lords of Manors in America. Retrieved 1 March 2018. Royal Descents, Notable Kin, and Printed Sources #69 by Gary Boyd Roberts from the New England Historic Genealogical Society. Genealogy of the Livingston Family by Timothy Alden, published in 1814.